Keder consists of two parts, a core and fabric. 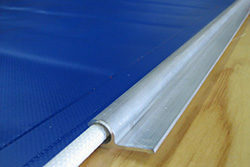 The core is made from extruded PVC, or another elastic material, to allow flexibility. The core is then wrapped in keder fabric, which has exposed fibers on the outside to allow the keder to slide into a frame, and coating on the inside, to ensure proper adhesion during welding. This is used for installation into specific types of framing systems.